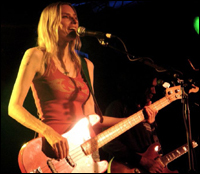 Here we are at the end of November and Aimee Mann’s @#%&*! Smilers remains comfortably atop my Best 2008 Albums list, where it has sat since its release in June. Nothing has really come close to toppling it, either. It’s not only the best album she’s ever put out but one of the best albums I’ve heard by anybody in years. I don’t think many in the business can write sad songs as well as she can, and even fewer can sing them as sweetly. And while she has a demonstrated capacity to rock out, it’s her recent focus on acoustic guitar, piano and bass that has pushed her music to a new level. Here’s a case where I don’t think the live performance does justice to the album version of this song… mostly because Mann has paid particular attention to the production of her recent albums. But it’s close enough. What is Columbus Avenue to you now? This entry was posted in song of the day and tagged Aimee Mann, Columbus Ave, Smilers. I probably don’t listen to enough Aimee Mann, and I certainly need to check out the new album given your rave reviews. While her music is not quite as diverse as someone like Costello, her songwriting is top notch and I truly enjoy her sound.